The site as it appeared this past fall. 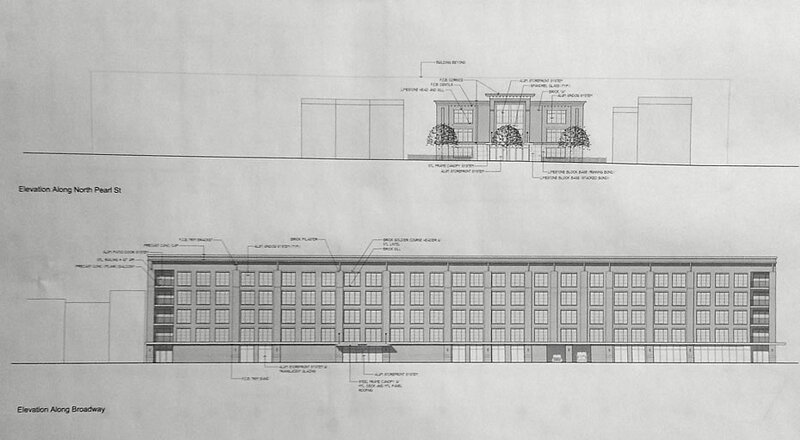 An elevation for the North Pearl Street side of the building. Downtown Albany has been experiencing a small boom in residential development over the last few years. The newest project on the board: a 100-unit residential/retail building planned for 760 Broadway. The site is located between Broadway and North Pearl Street, about halfway between Clinton Ave and the railroad overpass that unofficially marks the start of the Warehouse District. It has a long frontage on Broadway and relatively shorter frontage on Pearl. It's just up (and across) the street from the residential conversion at 733 Broadway. It's currently a parking lot. 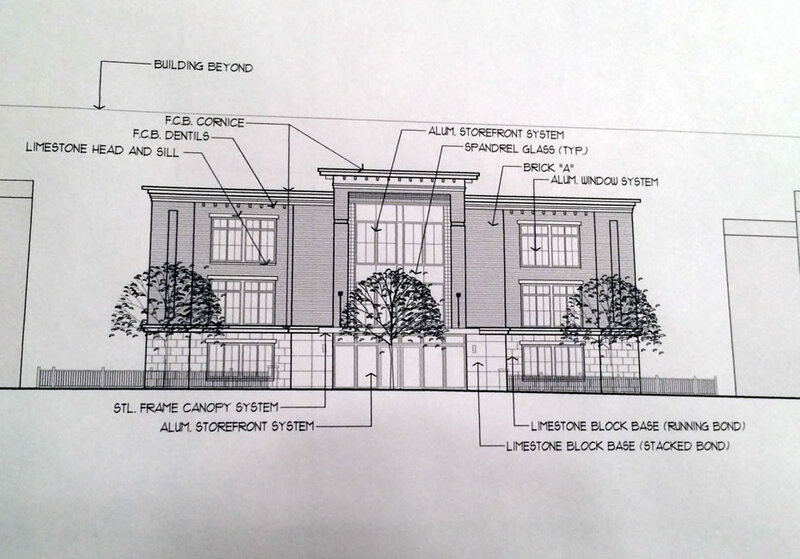 The plans presented at the planning board meeting Thursday are above in large format -- click or scroll all the way up. The developer behind the project is Fairbank Properties, which has been involved with two other large residential projects in the city in recent years. In 2012 it completed a residential conversion of a former school building at 27 Western (across from Washington Park). And it just recently completed a conversion of the Arcade Building at Broadway and Maiden Lane -- leasing started this past November. The proposed project for 760 Broadway is a roughly 190,000-square-foot mixed-use building. It'd be three stories on the Pearl Street side, and five stories on the Broadway side (the site slopes). 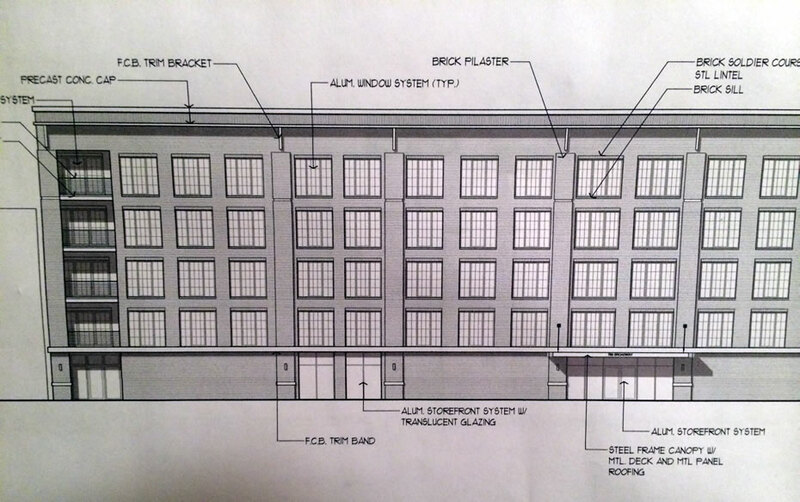 It would include 100 rental units -- the expected mix is 20 studios, 65 one-bedroom, and 15 two-bedroom. 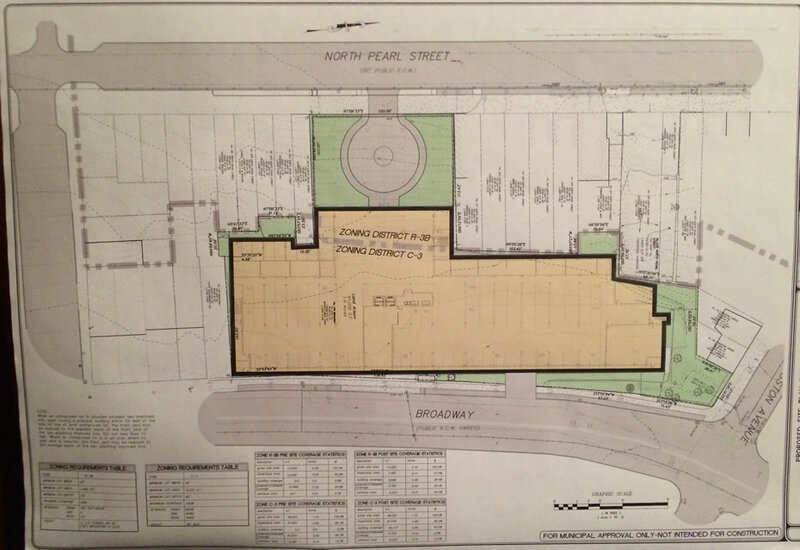 There would be 2,000 square feet of retail space along the Broadway street level. And a parking garage with approximately 115 spaces would be tucked under the building (with access from Broadway). Rents are projected to range from $850 to $1600. Estimated total cost of the project: $15 million. 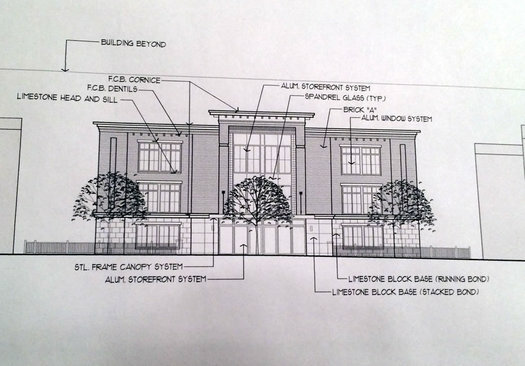 The developers have negotiated a PILOT arrangement with the Albany IDA. Estimated completion: maybe summer of 2018. That's going to be dependent on when approvals come through and when construction starts, which could be this summer. Why this spot and now? "I think the location itself, being that it kind of straddles the Warehouse District and downtown proper ... it provides an opportunity to mesh both neighborhoods together," said Fairbank's David Sarraf after the planning board presentation Thursday. "So I think location, given the number of units, given that it is new construction, hopefully will serve as a catalyst to really push the economic development in both of the areas to continue." Sarraf said downtown Albany has made good progress in developing residential units over the last decade. The neighborhood has added about 1,000 new units in recent years, and landlords say there's strong demand for them. But: "I think that we have a long way to go in terms of more residential units, in terms of more retail spaces -- whether it's food or other services -- as well as office, getting some good office tenants into downtown Albany so people can not only live down there, but work and eat and technically they wouldn't necessarily have to leave unless they want to." 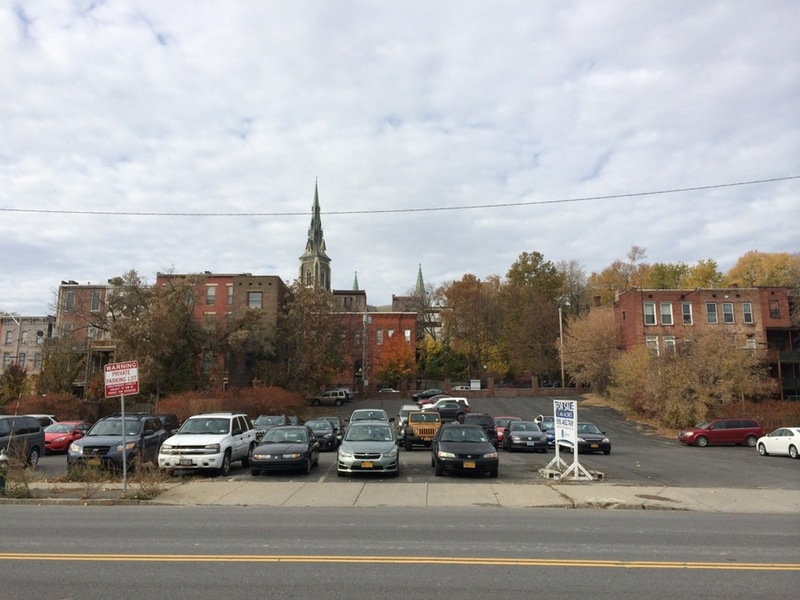 Sarraf described downtown Albany as still being a "speculative" market that needs to prove itself before a wider range of developers will come in. And how does it prove itself? "You have to keep building units and show that you can rent them." Let's make downtown Albany White again. I really wish people would look up the word gentrification before making fools of themselves. Hint:You're not displacing poor people from living in a parking lot. However, cities are for more than just the poorest among us, and this project and the others in the area are exactly what this city and area need. A MIX of incomes, and buildings on the parking lots. Let's not make downtown Albany entry again, J. Let's the city Mayor and constructors take a look at Saratoga Springs downtown and ask themselves- why Saratoga is soooo popular and downtown Albany is not? What they can offer to people who want to live around? Empty streets over the weekend, no stores, no boutiques, no grocery stores? Pricey apartments and condos? You can see rather ghosts over there than a social life. I'm slow clapping for JayK. And how about the "affordable" units among the 100? Would the 5% inclusionary zoning apply here? The city deserves to get something for the PILOT, even if only 5 new units, up to code, that lower income people can afford.